It is so much more fun to believe in things that can not be described, than just saying no … Based on that defiant, I live my life when it comes to spirits, trolls or talking to animals. It is by no means the things I fill my days with, much less spend time worrying about, but I think it’s more exciting to be open to the unknown. This was also my mindset as I entered the most haunted house of Sweden. My father is of the same opinion, and I guess that was why he thought he found the best birthday present ever for me a couple of years ago. He declared to me that the present was spending the All Saints day, Halloween, in the northeast of Jämtland, Sweden, at Borgvattnet´s vicarage. This was the time when I somewhat regretted my attitude, perhaps it had been better to be a non-believer in strange unexplainable things. This could have been the moment when I had gotten a SPA-weekend instead. But no, it was too late to back out at this point. We drove north through valleys, farms and deep green forests until we reached the small village of Borgvattnet north of Hammarstrand in Ragunda, Jämtland. I entered the mysterious old vicarage with mixed feelings and a kind of horrified delight of what was to come. How would I react if something actually happened? Something I had never experienced before? What if I was proven right about the fact that there are unexplainable phenomenon? It is all surreal and a bit embarrassing to write about now, but it was there and then when I for the first time sensed the presence of other energies, a distinct feeling of coldness inside. A bit like having half of the body standing in a freezer while the other half is in a sauna. I froze to the marrow as the divining rod in my hands gave signals of unknown presences. When it was time to sleep my dad and I were placed in the room of the crying ladies “Gråterskornas rum”. The room has its name from the stories of people having experienced three crying ladies sitting on the sofa of the room. My dad and I asked the spirits which side to choose of the double bed in the room and I was placed next to the window. We felt it best to keep the lights on and we both had difficulties falling in sleep. My dad and I spoke of our experiences, but it is not something we necessarily want to tell others. We share those memories my father and I, and we will always carry them with us, even if we may not ever be sure of what really happened. I am still convinced though, life is more fun if you dare to believe in what you can not describe! The tiny village of Borgvattnet with about 50 residents is in north-eastern Jämtland, might have the most ghosts per capita of Sweden. 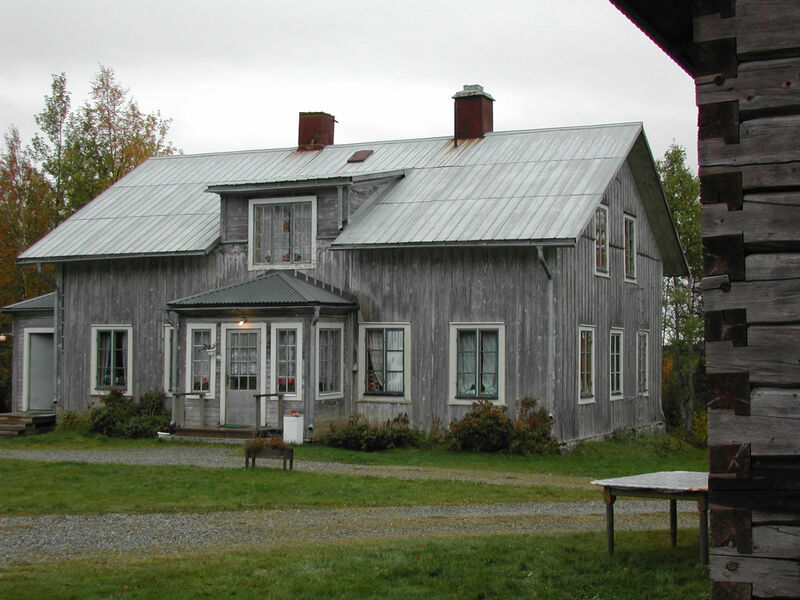 Rumours has the vicarage from 1876 to be the most haunted house in the Nordic countries. The first story of presences in the house is from 1927 and many reports of sightings have followed. For the brave there are 10 beds in five bedrooms in the house. Anyone who lasts the whole night receives a certificate of bravery. More information at borgvattnet.eu . The ghost hunting team of LaxTon run the Vicarage from May 1st 2018. Spooky Attraction with overnight possibilities. The Borgvattnet Vicarage is open to pre-booked guests from May to the beginning of November. Turn from road E45 south from Hammerdal. Drive on road 344 through the village Skyttmon with the grand wooden mansions and further til you reach the signage towards Borgvattnet, the vicarage is 1 km east of the village. Join a guided tour around the Vicarage of Borgvattnet and stay at the nearby Hostel or if you dare, stay the night in one of the rooms of the Vicarage. Skyttmon wooden mansions built 1874-1914 are impressive thanks to the fact that the farmers sold their own logs instead of using the services of a log company cutting prices. Thailändska paviljongen (The Thai Pavillion) – a golden pavillion in the middle of the birch forest thanks to the popular Thai King Chulalongkorn who passed by in 1897. Döda Fallet (The Dead Falls) – A semi natural disaster caused by one man called Vildhussen.